North Port is a fantastic town with a mixture of age groups and plenty of jobs. It is a Gulf of Mexico front town in between Port Charlotte and Sarasota. I just love it! And, oh, my goodness. . . some building lots have already been built on. 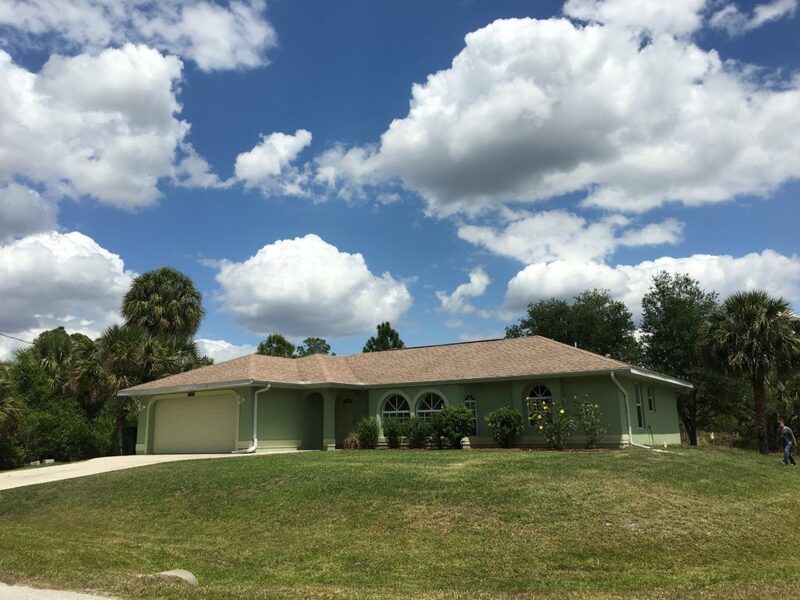 This webpage currently features a nice 3/2/2 concrete block home in a great North Port location. Close to restaurants, clubs, stores, and the convenience of it all. Great for grandmas, teenagers, youngsters, families, single people, of course grandpas too, lazy people, active people, and any type of person out there. Quality Builders built Hawaii III model home with plenty of upgrades. Bright & Airy, Meticulously-Maintained home on an attractive corner lot in a semi-rural, growing community with a beautiful Palmetto Palm view. This North Port neighborhood consists of many new homes and is conveniently located near shopping areas & main highways yet far enough away to enjoy a country lifestyle. Popular features include a spacious screened/covered lanai, open floor plan, arched living room windows, kitchen dining nook, light kitchen cabinets, large breakfast bar, plant ledges, attractive light-brown tile flooring, new carpets, large inside laundry, French doors, ceiling fans and hurricane reinforced garage overhead door. The Master suite boasts a tray ceiling, oversized walk-in closet, large bi-fold door closet, walk-in shower and a backyard exit/entry door (fabulous feature if you plan to install a pool in the future). The air condition system is new and there is a Manabloc Water Distribution System, which most newer homes feature, and a water treatment system. The home behind this property (on Sheboygan Ave.) sits on more than two acres which likely won’t be developed, making this house a nice investment. 2017 work includes: New Air Conditioner (1-yr on labor of parts, 10-yrs on parts & 10-yrs on compressor), New Bedroom Carpets, New Wood Blinds, Grout & Tile cleaned (5-yr warranty on sealant), Well & Septic serviced, Lanai re-screened, Appliances serviced, Dryer Vent cleaned, Interior painted and Interior & Exterior Windows cleaned. I-75 Exit 179 Toledo Blade, East on Toledo Blade, right on Cranberry, left on Beeville, right on Beloit Terrace. The home is located at the corner of Beloit and Sheboygan.